It's a sweet match-up of Colts vs. Saints at Hello Cupcake. You can't influence the outcome of Sunday's Super Bowl match-up (unless you're some kind of shady, all-powerful game fixer), but you can determine the winner of what's sure to be a messy fondant face-off at Hello Cupcake. 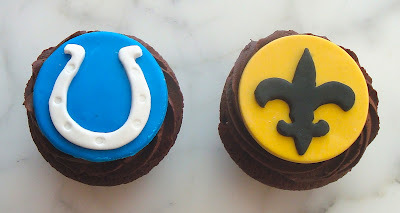 Through Sunday, support your team by purchasing Colts or Saints cupcakes at the Dupont Circle shop. One cupcake equals one point for your team. Get 'em individually or by the dozen. Order by Saturday at noon if you plan on serving them at a Sunday party. The logos can go on any flavor you like. Three hours before kick-off on Sunday, Hello Cupcake staffers will announce a winner. May the best cream win. The Colts cupcakes are gonna win b/c Saints fans are eating King Cake. I don't get football, but I do get cupcakes ;-) and since the husband is from Louisiana I will go pick up a cupcake (or half a dozen) for him. Super Bowl is a battle,while the super bowl cupcake ia a also battle.